Infiniti's EX30d arrives in July | What Car? 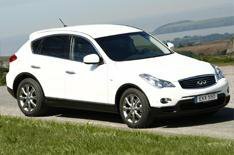 The Infiniti EX30d the car maker's second diesel model will cost from 35,975 when it goes on sale in July. The 3.0-litre V6 diesel has 235bhp, which will take the compact 4x4 EX from 0-62mph in 7.9 seconds and on to a top speed of 137mph. Average fuel consumption is 33.2mph, while emissions are 224g/km. The CO2 figure is just low enough to put the EX30d into VED band K, which costs 550 a year, with an additional 'showroom tax' fee of 245. Like other Infinitis, the EX30d is well equipped. The standard version comes with a seven-speed automatic gearbox, front and rear parking sensors, self-healing scratch-resistant paint, alloy wheels, electrically adjustable front seats, cruise control, Bluetooth connectivity, plus a seven-speaker stereo with six-CD changer and MP3 input. The EX30d GT costs from 37,305 and gets leather upholstery, extra adjustment for the front seats, electrically adjustable steering column, heated front seats and air-conditioning in the rear. For 41,220 you can upgrade to the EX30d GT Premium, with its intelligent cruise control, a brake-assist programme that provides added stopping force in an emergency and a Lane Departure Prevention system that can brake the wheels on one side of the car to stop it drifting out of the lane it is in. Around View Monitor, which uses cameras to provide a 360-degree bird's eye view of the car and its surroundings, is also standard.